Onset printers are the fastest in the world at like for like quality. The technology is world-leading: powerful linear motors and vacuum beds that can hold up to 80kg of media; full width printhead arrays and UV lamp systems allow almost instantly cured print; powerful handling systems ensure phenomenal productivity. The Onset X’s print engine and fast moving vacuum bed are built on a very robust chassis which enables pin-point drop placement accuracy for billions of drops per second, all day, every day. Inca engineering combined with dedicated Fujifilm ink chemistry ensure Onset X delivers excellent reliability. But that alone doesn’t necessarily mean the printer is working with maximum efficiency. It is necessary to consider other factors like how print quality is maintained, how media is loaded and unloaded from the printer, and setting up between print jobs. Any deterioration in print quality would mean stopping to clean print heads, or slowing the printer down to run in a print mode with a higher number of passes. Intelligence features enable Onset to monitor its own condition to maintain optimum performance, print quality and minimise printhead deterioration or damage. Sensors monitor the amount of UV light exposure around the print carriage and control the cleaning cycles in the daily schedule to maintain optimum performance and printhead life. 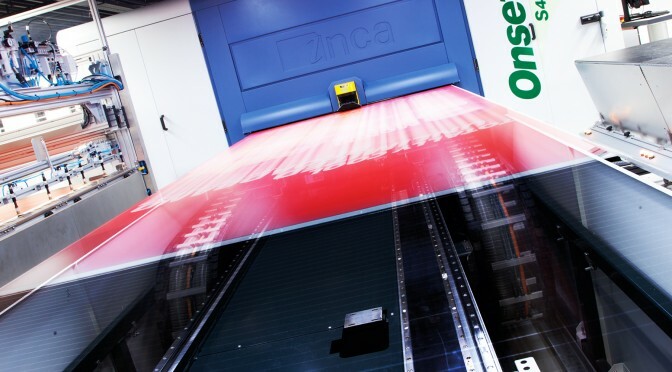 Inca’s iNozzle intelligent nozzle mapping system maintains print quality even if printhead nozzles are missing or deviating which would otherwise be seen as very visible print defects. Vacuum level monitoring will stop printing if the pressure is too low to hold the material securely. This helps to prevent possible damage to the print carriage when printing porous materials. The material height detection system detects lift across the material and ignores small defects in the surface which do not pose a risk to the print carriage, reducing unnecessary stoppages and downtime. If the print operator is unable to keep up with loading media as fast as the machine prints, short periods of delay can exist between each print, which at the end of a full day of production, can add up to hours of downtime. Short-run jobs can be printed with manual loading and take-off, but as an Onset can finish two full beds of print in less than a minute, a fast and powerful handling system is vital if Onset is to perform to its full capacity for longer runs. Onset’s handling system options can be configured to best suit your production environment, printing single sheet, multiple sheet or double sided print in registration. There are three types of handling system available for Onset: 3/4 semi-automatic handling; fully automatic handling for display POP; fully automatic handling for corrugated board. Onset’s flatbed vacuum table is divided into fifteen independent zones, which can be switched on or off according to the size of the material being printed. This minimises the amount of bed masking required around the print.